Eccentric over barrel rifle suppressors - anyone know? Thread: Eccentric over barrel rifle suppressors - anyone know? Just picking brains... does anyone know of a manufacturer of an eccentric, ideally over-barrel suppressors for .30 rifles such as .308 or .303? 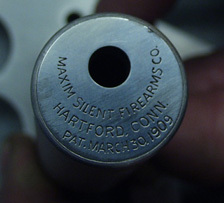 I know Hiram Maxim made one at the dawn of time for his machine guns, the steel spiral baffles of which were later copied in the de Lisle .45, but uncle Google does not help further ("Eccentric suppressor" search just gets you up Osprey, a manufacturer that makes eccentric pistol suppressors). Kiwi Greg, gadgetman, tetawa and 6 others like this. No I have only seen the Salvo 12 for shotguns. It's more complicated to make than a round one. Yes, the Maxim ones were THE shape to use back then as most people then used iron sights. I'm thinking of a .303 de Lisle setup myself and I prefer buying a can to attempting to make one myself - except of course you can make it quite large for a de Lisle look so it would be quite forgiving. I have made a few eccentric screw-on suppressors. They are a pain in the arse to make in comparison with concentric units, and the only major advantage they offer is the ability to use iron sights. They do give a slightly better suppression performance because of the inconsistent gas flow. The best eccentric design I have made in terms of performance and suppression is of rectangular cross-section, giving a greater internal volume than a cylindrical unit of similar dimensions. He looks like an interesting character, what was the story with him? gadgetman and rossi.45 like this. And, in my experience at least, completely ineffective. He made and sold, or at least attempted to sell some pretty over the top tacticool gun designs. Think flames and sparkly bits. Probably would have been an interesting bloke to have a beer with. Rev Rog had different ideas in designing affective suppressors, never got around to the barrel protector sleeve. No one else in the industry has matched his suppressor colour schemes. Even told me he threaded barrels with a die nut when they wouldn't fit in the lathe. A very nice guy, miss the odd chat I had with him. He certainly was quite an amiable man, very easy to deal with. I see, so blast gets channeled left an right, down, round, then towards the centre where the two opposite waves meet... equal and opposite forces cancelling each other out, turning velocity into heat. I wonder how an eccentric suppressor with no baffles would perform - just a 2" sleeve, and a long internal muzzle brake jetting left and right.